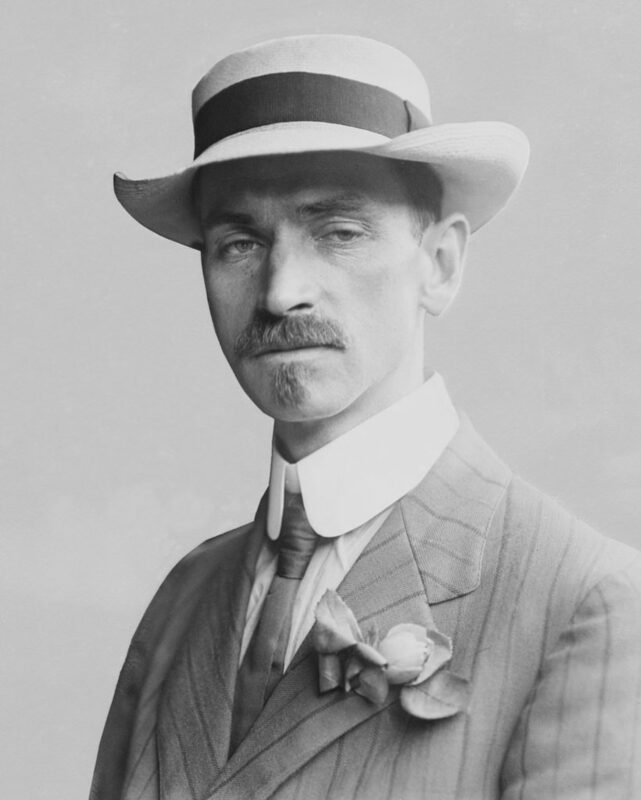 Glenn H. Curtiss is best known as the founder of American aviation, but he also played an important role in the technical development of American motorcycle design. It was motorcycles, as well, that led to Curtiss’ involvement with airplanes and dirigibles, as his v-twin motors proved extremely reliable by the standards of the day, using ball bearings throughout, instead of poorly lubricated plain bushings common with main and big-end bearings at the time. Curtiss discovered ‘the need for speed’ as a young Western Union telegram delivery boy in the 1890s, where a quick delivery of a message often meant a good tip, and the boss typically give more lucrative/important clients to the fastest cyclist. Curtiss graduated from informal sprint challenges with other bicyclists, to become a full-fledged track racer, and was soon a well-known champion on around Hammondsport, NY. His aptitude with mathematics, engineering, and tinkering was evident from a young age, and soon he began manufacturing bicycles under the ‘Hercules’ name. 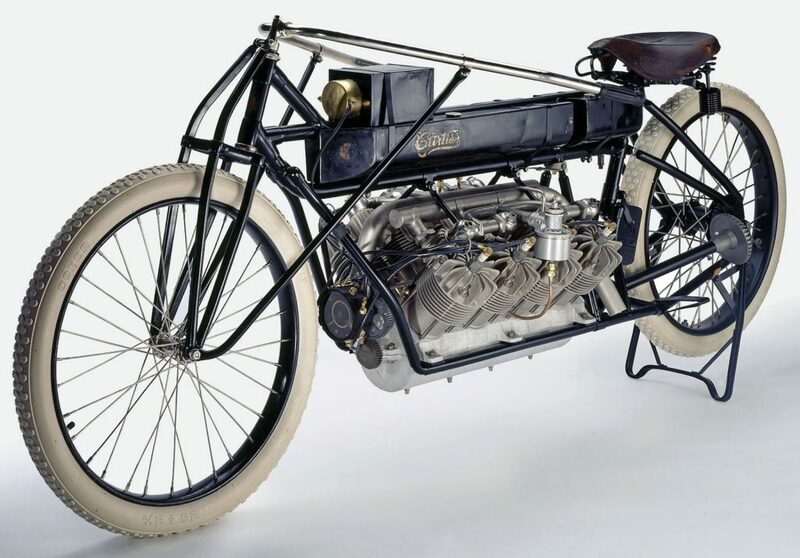 In 1899 Curtiss built his first motorcycle, after purchasing an E.R. Thomas engine – sold as the Auto-Bi – a 1hp single-cylinder AiV motor (no intake camshaft, just suction to bring in the fuel mix). 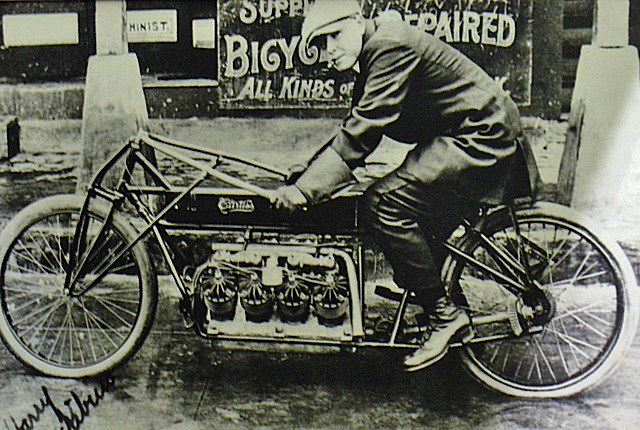 This first machine became known as the ‘Happy Hooligan’, but the engine was too weak for his taste, so he ordered the most powerful engine kit from Auto-Bi (3hp), which was an improvement…when it ran. Curtiss felt he could do better, and had engine castings made to his own design in 1901. 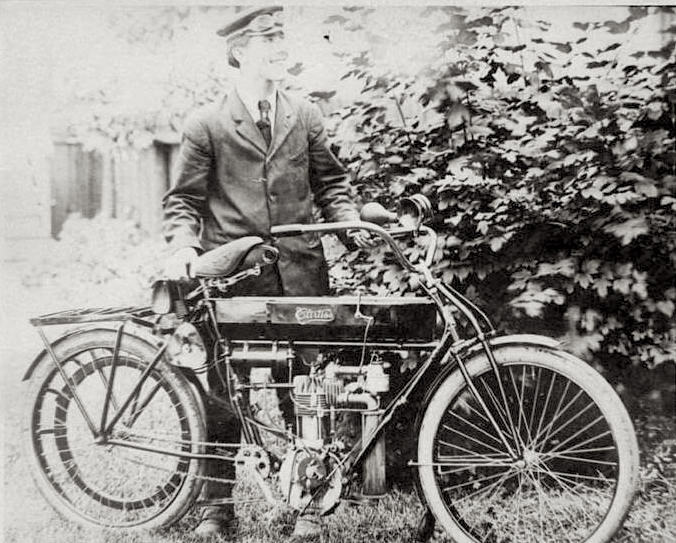 By the spring of 1902 he was marketing his own motorcycle, also called the Hercules, a single-cylinder machine which was sold at his 3 bicycle shops, in Hammondsport, Bath, and Corning. The engines were robust but light, and Curtiss pioneered the use of ball bearings throughout the engine, which reduced internal friction (compared to shafts running direct in poorly lubricated castings); he claimed his motors produced the most power of any motorcycle available, and proved it on the race track, gaining the nickname ‘Hell Rider’ Curtiss. In 1903, Curtiss himself set his first Land Speed Record at 64mph for one mile. He also won an endurance race from New York to Cambridge, Maryland, beating out the products of much larger factories, like Indian. 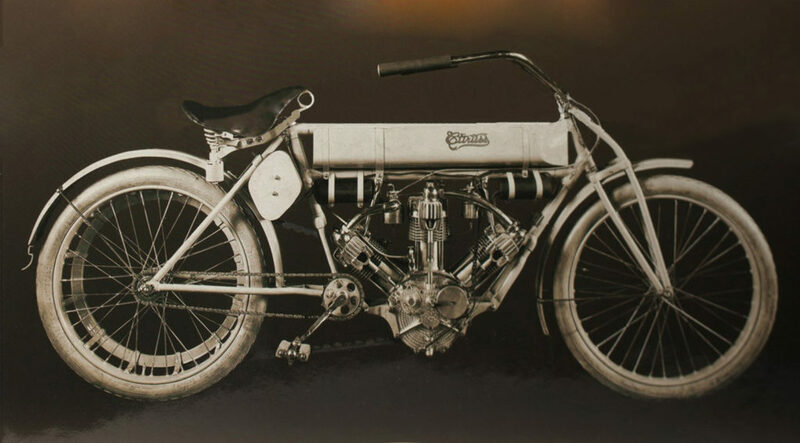 E.H. Corson of the Hendee Mfg Co (manufacturers of Indian) visited Curtiss in Hammondsport in July 1904, was somewhat shocked to find the legendary Curtiss motorcycle was built in a very small shop on Curtiss’ property, with the help of family members and friends. Curtiss production was quite small (and some estimate only a dozen or so survive today), but his impact on the industry was enormous. By 1904, Curtiss built a racing motorcycle of 5hp, and began to make the rounds of competitions, winning frequently. He journeyed to Daytona that year to participate in the open speed trials on Ormond/Daytona beach, breaking all the 2- to 10-mile records in the process, and averaging 67.41mph for the 10-mile record. Curtiss aboard a special racing version of his ‘Double Cylinder’ model in 1905; note the dual torpedo tanks! By 1905, the ‘Hercules’ name was forcibly dropped, as another company was found to own the brand, and henceforth his machines were simply called ‘Curtiss’. The range included 2.5hp and 3.5hp singles, and a 5ph twin, all with direct belt drive. His engines gained renown for their strength, reliability, and speed; qualities in rare supply in 1905! His reliable engines attracted ‘Captain’ Tom Baldwin, a circus performer turned daredevil, who travelled to county fairs all over the US in a hot air balloon. Baldwin wanted a good motor to power a dirigible, which he built at his workshops in San Francisco. Baldwin’s ‘California Arrow’ became a regular sight in the Bay Area, and Baldwin entered a competition in St. Louis in 1904, with a prize of $100,000 – a phenomenal sum – offered to an aviator who could successfully fly to 2,000 feet, make a 3.5 mile loop, and land at the take-off point. Baldwin’s machine was the only airship capable of making the course, and the response from the huge crowd was tumultuous. 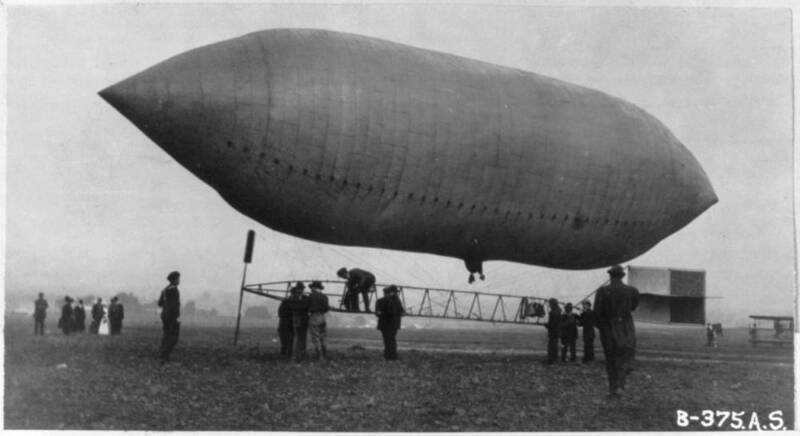 Seeing that controlled flight was indeed possible, demand for Baldwin’s dirigibles grew exponentially. Baldwin returned to San Francisco after an extensive tour with his flying machines, and continued building dirigibles until the 1906 San Francisco earthquake leveled his factory. Captain Tom Baldwin, having established a successful relationship with Curtiss, then moved to Hammondsport to begin business together, and explore heavier-than-air flight. 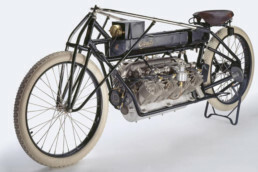 This marked the beginning of the Curtiss aviation story, and soon the end of the Curtiss motorcycle story, as the company began to focus on building better motors for dirigibles and airplanes. Alexander Graham Bell was suitably impressed with Curtiss, considered him “the greatest motor expert in the country,” and invited in 1907 Curtiss to join his Aerial Experiment Association (AEA), with the aim of building a functional airplane. Curtiss was the primary designer of the ‘June Bug’, the AEA’s 3rd aircraft, which used wing-warping to lift, turn, and descend, and was entirely successful, becoming the first officially observed flight in history on July 4th, 1908, winning the Scientific American trophy and $2500 in the process. The Wright brothers may have catapulted a motorized kite into the air before Curtiss flew, but flew he did, in front of the world. The California Arrow in 1904, the first truly successful powered aircraft in America, capable of flying thousands of feet high, and propelling itself wherever it was directed, weather permitting. It used a Curtiss v-twin engine in the framework below the oiled silk gas bag. The entire contraption weighed a mere 520lbs, and took 8000cu’ of hydrogen to fill the 52′ long bag. 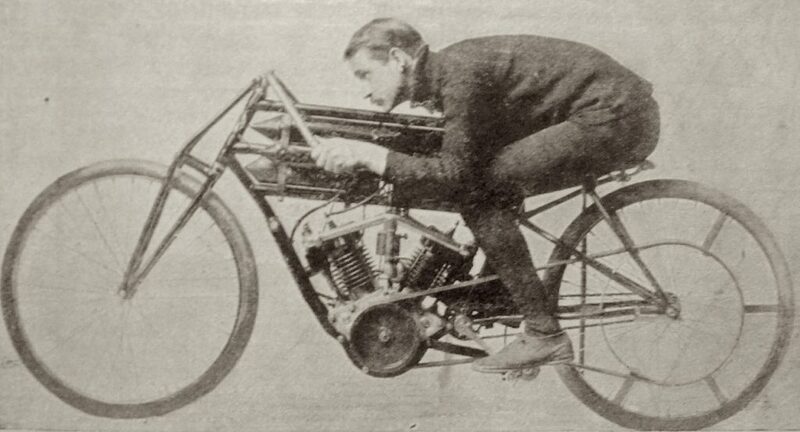 But his greatest motorcycle feat was yet to come; in a final bid to quench his speed lust, Curtiss built a spindly motorcycle frame around an experimental V-8 dirigible motor in 1906, and travelled again to Ormond Beach Florida for a bit of sand racing. After the end of ‘normal’ speed runs with production bikes, Curtiss brought out his Behemoth with 40hp, and scorched through a 1-mile trap at an average speed of 136.3mph – the fastest speed of any powered human to date. His ‘return’ run was marred by the disintegration of the direct shaft-and-bevel drive used at the rear wheel (and should one be surprised, with an exposed u-joint, 40hp, and a sand bath? ), and the rear wheel locked at speed while the drive shaft flailed away at the rider… but Curtiss’ considerable track experience came to the fore, and he was able to haul the beast down without further drama. Curtiss had some hairy moments, but never crashed his motorcycles or his airplanes, which ranks as unique among his peers. Curtiss aboard the V-8 at a photo op before the speed run. An incredible machine then as now! While Curtiss’ record was unofficial, it spoke volumes about the man’s bravery, riding skill, and technical abilities. 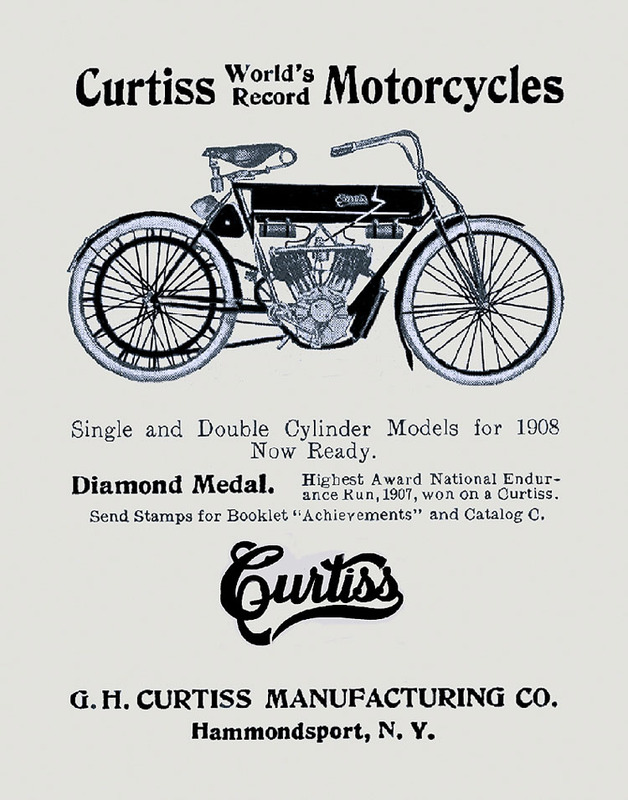 As aviation took more of his interest by 1908, and demand for his services as an airplane designer increased, Curtiss turned his attention away from motorcycles, and handed over the running of the business to friends and family members. 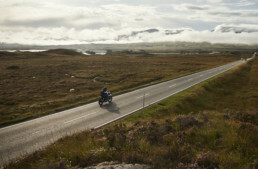 Development of his remarkable motorcycles stopped when their creator turned away, and the company was wound down by 1911. Curtiss turned his full attention to wings, becoming the first man to design and fly a proper airplane, capable of taking off under its own power and maneuvering back to its starting point. He traveled the world demonstrating his machine’s abilities, which were unequalled in the day, and went on to invent the seaplane, and became the first licensed aircraft manufacturer in 1909. During WW1, Curtiss Aviation produced planes for the US Military, like the Curtiss JN-4 ‘Jenny’, and the company expanded for what was a bright future. In 1920, Curtiss sold his stock in Curtiss Aviation for $32Million, a simply enormous sum in those days, and pursued other projects from his home in Florida. He died of complications from appendicitis in 1930. Like I said on the Curtis/Confederate page . I get it . I really do . I know the history . All too well in fact including Curtis’s massive failures . But that still neither justifies Confederate changing heir name to a long forgotten moniker ( with few exceptions such as us ) not does it make a damn bit of sense business wise . Which is why I’ll prognosticate that … we are witnessing the end of yet another iconic boutique M/C manufacture before our very eyes . 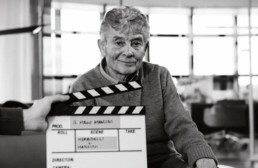 In closing … As the bard ( Randy Newman ) said … ” I Might Be Wrong Now .. But I Don’t Think So ” .. unfortunately . And again thank the gods of gearheads worldwide that JT Nesbitt made his escape from Confederate … when he did . I would love to see that V8 dirigible engined monstrosity fire up. Imagine the noise and spectacle on that beach in 1906, when Curtiss rolled that bike out onto the sand, the crowd blown away by the furious sight and sound of that machine reaching a dizzying speed of over 130 miles per hour! Another great article, keep em coming. Paul, I have been researching the early years of the motorcycle Land Speed Record and it is surprisingly difficult to track down exactly what Curtiss achieved in 1903. How sure are you that the widespread claim “In 1903, Curtiss himself set his first Land Speed Record at 64mph for one mile” is correct? Is there a contemporary reference to back it up? Not trying to pick holes in an excellent article. Just trying to understand what really happened. Hi Richard, the 1903 record is documented in a few places, which may or may not be available online. I’ve seen it referenced in period magazines, and in biographies of Curtiss. I’m far away from my library right now to confirm, but as always, there’s room for improvement on the historical record… I think the best history work is done re-examining what is ‘known’!